on Gene Soucy's flight jacket. Custom designed for The French Connection and produced as an award-winning poster. 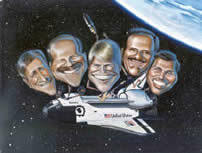 Caricature of the STS-26 crew, which was actually flown aboard the space shuttle Atlantis on STS-27. 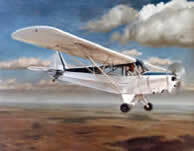 this could be you in your airplane! 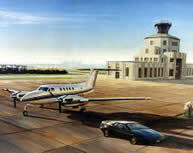 old Houston Hobby Airport terminal. of the Reno Air Races. Nose art for the Planes of Fame B-25. Mel Gibson flew it in "Forever Young." 12x18 $ 1,520. $ 1,440. $1,360. 18x24 $ 2,560. $ 2,450. $ 2,320. 20x30 $ 3,520. $ 3,360. $ 3,200. 24x36 $ 5,360. $ 5,210. $ 4,850. 30x40 $ 6,720. $ 6,400. $ 6,080. 36x48 $ 9,360. $ 8,880. $ 8,400. This is a basic list of estimated prices, priced by size, and not by the amount of artwork in each particular painting. Because each painting is an individual and original work of art with a wide variety of factors, such as size and number of main subjects (aircraft), background subjects and settings; the price of each painting may differ either higher or lower than the estimatedprice list. 14x18 $ 960. $ 910. $ 860. 18x24 $ 1,600. $ 1,540. $ 1,450. 24x36 $ 3,360. $ 3,200. $ 2,880. 36x48 $ 5,850. $ 5,550. $ 5,260.
on the number of characters and/or airplanes.